How we work, Ortis - printing house. 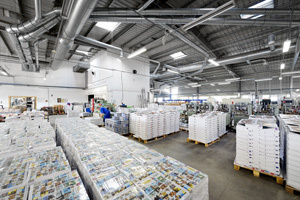 We print magazines, catalogues, advertising materials, leaflets, books, folders and brochures. Before a magazine, catalogue or a leaflet can be produced, the author must turn their ideas into an electronic project. It later goes through a number of stages, the final of which is a delivery to the Customer. It all starts with the Publisher, who creates a vision of the product and prepares its electronic version. We begin our participation in the process at the Sales Department, where we decide about all fundamental print parameters (circulation, format, paper type and basis weight, colours, volume). We are open to suggestions and ready to assist our Customers. Our vast experience, professional attitude, and passion, which we utilise to perform every task, let the Customers feel secure and trust our advice. Having calculated the price for a given project, we order paper and inks, set the production date, and notify the Customer Service Department. Our technicians then prepare a production schedule, plan the printing process, and provide advice on the preparation of materials to be printed and on the use of colours. They supervise the order until dispatch, which ends the production. The Publisher sends electronic version of materials to the Design Studio, where designers check the files and perform test prints. Then the files are received in the Prepress Room, in which we do the electronic editing as necessary (so-called imposition). Once correctness of prepared materials is confirmed, we start exposure of printing plates (CtP). Now, we are ready to move to the Production process. 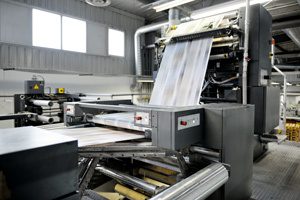 Depending on the type of production, we use either the Heidelberg Speedmaster sheet-fed printing press or one of our web-fed rotary presses (Harris M-600, M-1000). Each of these presses has some specific properties, and by using them we are able to provide a wide range of production services. They can all be used to make colourful folded sheets from blank paper; and despite high automation or printing, they still have some of the magic of fresh paint smell. Printed material goes to the Binding Shop where loose sheets, coming out of the printing press, are turned into complete and beautifully bound products (wire stitching or gluing). The binding is often preceded by folding, creasing, die cutting, trimming, and assembling. Bound products are moved to the Dispatch, where they are packaged as requested by the Customer and shipped to the Publisher.